Wow. Sometimes it really does pay to pause and reflect. 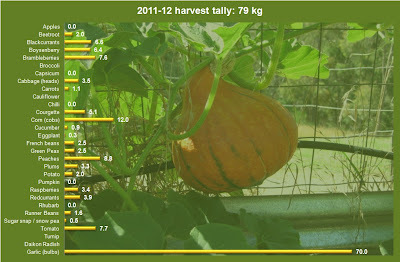 Over the weekend I updated my harvest tally for the 2011-12 season, and came to the staggering conclusion that even this early into the season we have grown over $2000 worth for fruit and veg!! 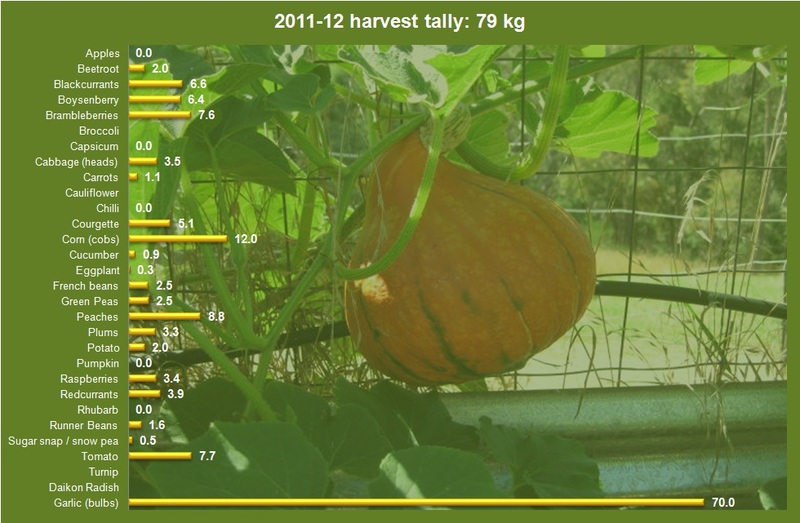 I have weighed recorded almost everything we grow (minus what I eat in the garden , and herbs and leafy greens). On Sunday I did some online research and put per kg prices for the equivalent organic item next to everything and added it up - $2047. And that's probably a bit higher as I didn't weigh or include all the lemons and limes. It really is quite sobering to see how much all that produce is worth - we tend to take it for granted a bit. In some ways it is a paper only saving - we'd never actually spend that much on berries if we had to buy them - we'd just be going without. But either way, it has been an interesting exercise. Well done, I do envy you all those berries. Did you count up the cost of all the jars of preserves you made as well? i think I saved a fortune on passata. And growing your own food doesnt matter how big or small the harvest is priceless. Well don on your harvest.